Roof windows and skylights are popular choices when it comes to roof designs. However, it’s important that any roof window is installed correctly to create a water and windproof barrier between the join of the roof and the window itself. 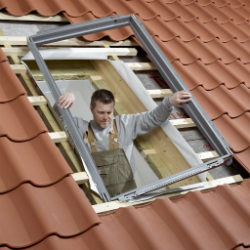 At Ashbrook Roofing, we stock flashing kits for roof windows to ensure that windows are installed properly. Roof window flashing kits also add a flush, professional finish to the installation of a roof window. Regardless of your budget, you should never opt for cheap, low-quality flashing, as this will undoubtedly lead to problems later. You should also never be tempted to mix and match between different manufacturers. A VELUX roof window needs a VELUX flashing kit, to ensure a tight and efficient finish. What’s more, flashing kits for roof windows are designed in different thicknesses, depending on whether your roof surface is slate, tiles or profiled; so it’s important that you choose the correct kit for your roof. Unsure about what you should be looking for? We’re a team of roofers with more than 30 years’ experience of working in the industry and we’re on hand to provide technical advice and support, to ensure you choose the right product for your project. We also stock a range of installation products for roof windows. Whether you’re a professional roofer or making some improvements with the addition of a skylight, we’ll offer the same high-quality products at trade prices. Contact us today for free and impartial advice. Alternatively, you can place your order online today with Ashbrook Roofing. We’re here to make your life easier, as we offer next day delivery when you order by 2pm, as well as a seven-day no quibbles return policy.